I have always been known as someone to seek out different events in Reims. You can usually find me exploring a museum, walking along lesser-known streets, or continuing my quest for the best cookie in the city. This has lead to many peculiar experiences, including the time I went to a cat show in the suburbs of Betheny. My goal has been to find something new each week in order to learn more about Reims. 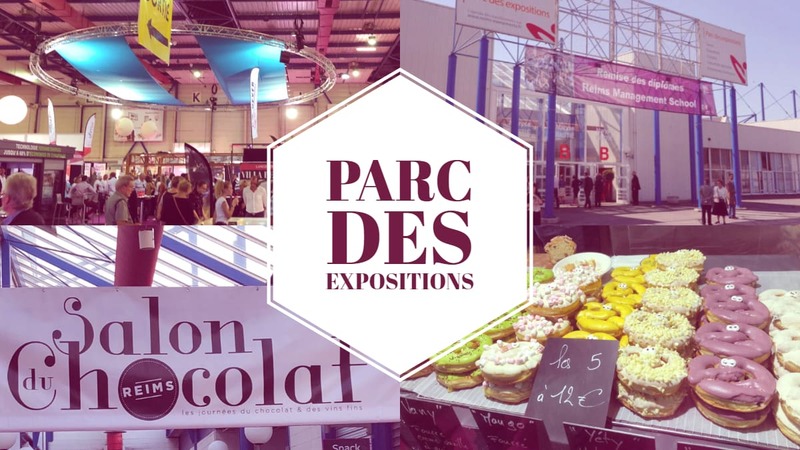 One of the most frequent questions I get when talking about my weekend is: “Where do you find all of these different things?” Usually, my response is the same: The Parc des Expositions, of course! Located mere minutes outside the main city center, the Parc des Expositions is home to most of the main festivals and shows in Reims. Since arriving here in August, I have been to several events: the Chocolate Expo, the Wine Expo, the Reims Travel Show, a historic car show, an antique show, and most recently the delicious Food and Wine Festival. All of the events are frequently advertised around the city, with posters at bus stops or with posts on Facebook from the official tourism page of Reims. The atmosphere of the venue changes depending on what is being presented, but the general concept remains the same. There are two main halls, Hall A and Hall B, connected by smaller hallways in the venue. Typically there are two different events going on in the different halls. One time when I was there for the Travel Expo in Hall A, I ended up wandering into the free historic car show in Hall B, which was quite an enjoyable experience. The high ceilings make the building look like an airplane hangar, and it feels like the stands at the expo are never ending. There are also inexplicable yet delicious smells that follow you no matter where you go in the venue. Prices are not much to worry about as the maximum admission I have ever paid to get into an expo is five euros, and that included a complimentary wine glass! You can even get in for free to some events like the historic car show. While others do charge for admission (usually around 3 euros for students from what I’ve noticed), they sometimes give specific times when you can come in without paying for admission. The Food and Wine Festival was the weekend of March 31 and the vendors offered free admission after 7 PM, which works out perfectly for people with a full school schedule like me. The venue itself has its own restaurants which are a little expensive but quite delicious, but I would recommend saving your money for the food inside the exposition if you’re going to some gastronomic event. There are already some festivals being advertised for the fall of 2019. I am most looking forward to the Office de Tourisme du Grand Reims because they will be discussing what has changed in the city since the recent renovations. Of course, I am also thrilled to see the return of the delicious Chocolate Expo during the midterm season! I hope to see more Sciences Po students roaming the different halls throughout the upcoming school year and beyond. To get to the Parc des Expositions from Sciences Po you can walk, which takes about thirty minutes. I would recommend going down the canal for a lovely stroll to the venue. There are also buses to the Expo which are convenient, take Line 6 from Saint Maurice which comes every twenty minutes and you’ll be there in no time! Cover illustration by Chloé Joubert @The Sundial Press.